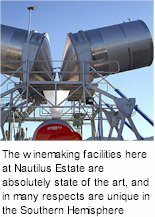 Nautilus Estate's Renwick Vineyard comprises seven hectares of classic stony 'Rapaura' soils, planted in Sauvignon Blanc, Chardonnay and Pinot Noir. This mature vineyard provides key blending components to both Nautilus Pinot Noir and Chardonnay. Nautilus also holds ten hectares of picturesque glacial river terraces on the Awatere River, planted in Sauvignon Blanc, Pinot Noir and Pinot Gris. First planted in 1992, this low yielding vineyard is characterised by intense fruit flavours and fine aromatics. Harvest is typically 7-10 days behind the Wairau valley. The estate's Opawa Vineyard is located on Rapaura Road, this 25-hectare vineyard was planted between 2001 and 2003 principally in Sauvignon Blanc to help meet the insatiable international demand for Nautilus Sauvignon Blanc. One and a half hectares of Pinot Noir have also been planted to continue our development program with this variety. Part of the block is an area of river gravels that were once part of the old Opawa river flood plain. 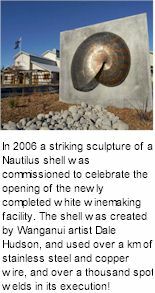 In January 2004, Nautilus Estate purchased its fourth vineyard, located within 5 minutes drive of the winery across the Wairau River at Kaituna. This twenty hectare block was planted in 2002 and 2003 in Pinot Noir (1.5 Ha) and Sauvignon Blanc (17 Ha). Although it is in close proximity to our Opawa and Renwick vineyards, the site is cooler and we can expect a later harvest. This in turn will result in a different set of aromas and flavours and a new blending component for our Sauvignon Blanc and Pinot Noir, delivering another layer of complexity in the finished wine. 5.5 hectares of mature Pinot Noir was planted at the Nautilus Estate Clay Hills vineyard between 1999 to 2003 with a good selection of premium clones: UDC5, 114, 115, 667 and 777. This site is located on an elevated hillside on the Eastern Omaka Valley and was puchased by Nautilus Estate in 2007. Viticulturalist Mike Collins says "With our existing company vineyards on the Wairau Valley floor and in the Awatere, already producing trophy winning Pinot Noir, the one thing we lacked was a premium southern valleys hillside site. The Clay Hills Vineyard fits the bill perfectly and will add great mid palate structure and texture to Nautilus Pinot Noir"
All the equipment used here is only for Pinot, all designed to handle the fruit as gently as possible and allow the natural intense flavours and aromas – the expression of the different vineyards to come to the fore. The tanks have both heating and cooling capacity, enabling us to cold soak prior to fermentation and warm or cool ferments as necessary. The crusher is mounted on a rail above the tanks and a 'Taylors' bin lifter is used to elevate the fruit and feed the crusher/destemmer. The fruit is destemmed directly into the tanks avoiding the use of a must pump.